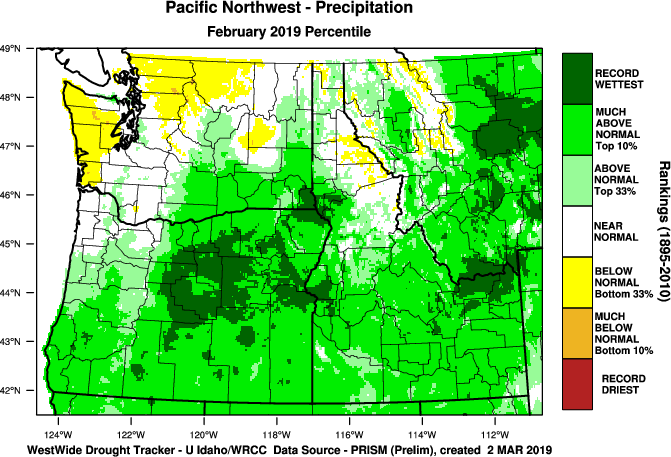 February 2019 precipitation ranged 200-300% of normal across southern and central Idaho, southeast Washington, and across eastern Oregon. Several places recorded their February precipitation record. 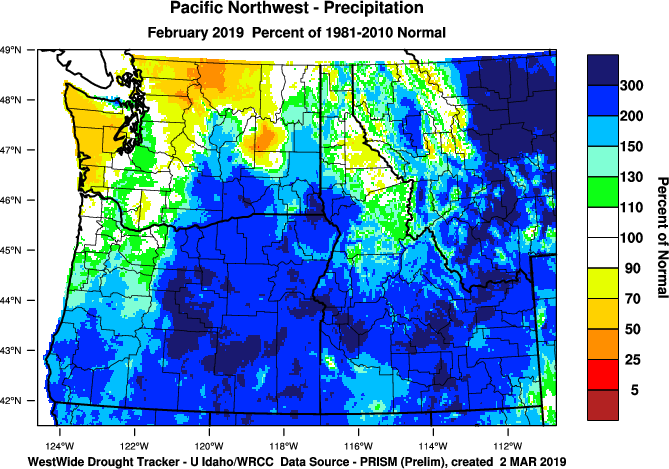 McCall set the all-time precipitation record for February at 7.57″ (normal 2.42″). 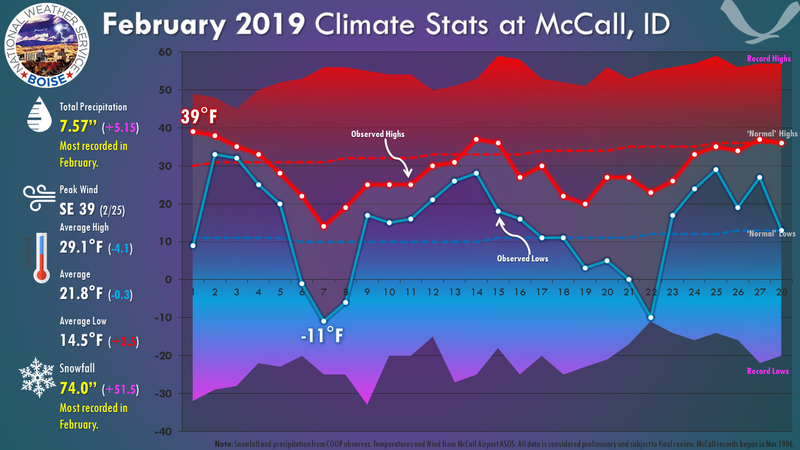 McCall set the all-time snowfall record for Feb at 74.0″ (normal 22.5″), the most in Feb since 1975 when 70.0″ fell. Records began in 1906. Courtesy of COOP observer. 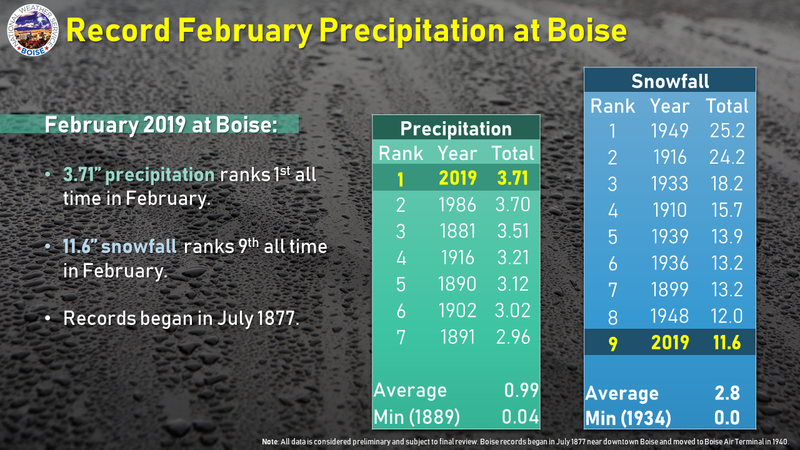 Boise set the all-time precipitation record for February at 3.71″ (Normal is 0.99″). 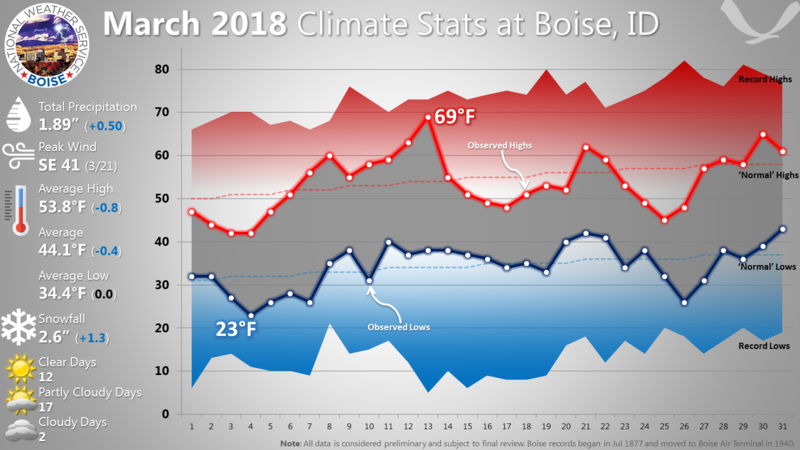 Boise received 11.6″ of snow in February, the most in February since 1949 when 25.2″ fell. Records began in 1877. 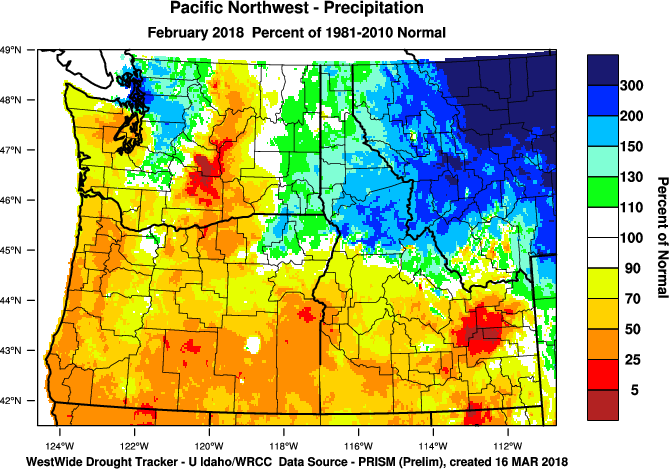 Baker City, OR and Ontario, OR both broke their all-time February records for precipitation. 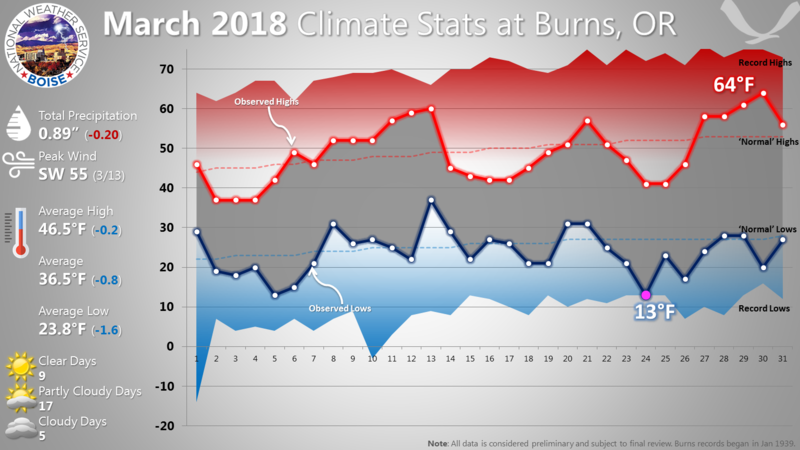 Burns, OR came in at 4th most all-time for February. 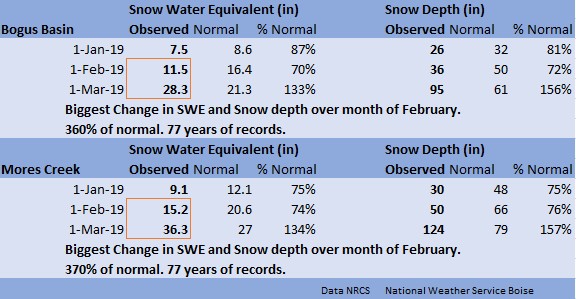 Mores Creek Summit and Bogus Basin snow surveys reported the biggest change in snow depth and snow water equivalent in February since records began in 1942. 360-370% of normal. 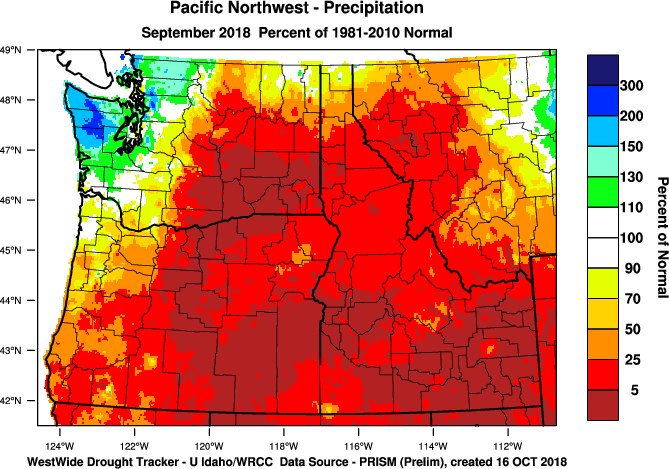 With only a trace of rain, September 2018 was one of the driest Septembers on record. There were only 9 others with no measurable precipitation in 152 years of Boise area records, and only 5 others in 78 years of airport records. Temperatures averaged only slightly above normal. September began with near normal temperatures under dry westerly flow aloft. The flow backed into the southwest on the 5th as a high-pressure ridge built over the northern Rockies. This resulted in the last 90-degree highs of the summer on the 5th, 6th, and 7th. A cooling trend commenced on the 8th as an upper-level low-pressure trough from the Gulf of Alaska approached the British Columbia Coast. As the trough edged closer, a dry cold front passed Boise on the 10th, followed by cooler north Pacific air. Highs were only in the low 70s from the 11th through the 13th. The trough remained parked over the west coast through the 18th, keeping temperatures a few degrees below normal. It finally moved inland on the 19th, then continued east out of our area on the 20th. Brief warming followed on the 21st and 22nd, with highs in the low 80s, but another north Pacific trough was on the way. Rather than stalling over the coast, this trough continued on an eastward track, pushed along by a building upper-level high-pressure ridge offshore. The trough was east of our area on the 24th. Like its predecessors, it produced no rain in the Boise area. 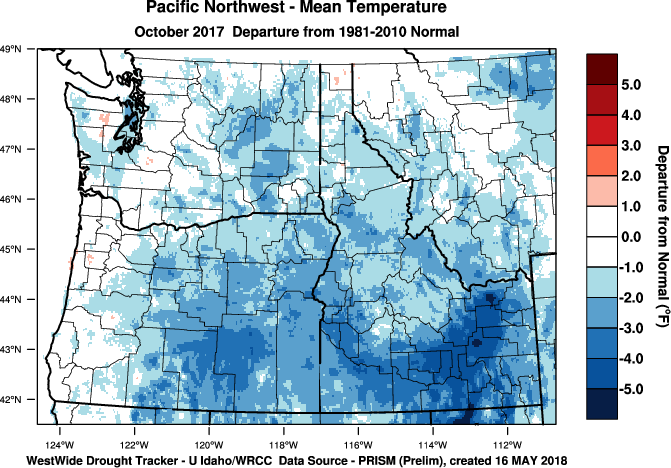 East of the ridge, northwest flow aloft over the Pacific Northwest states kept temperatures 5 to 10 degrees below normal, with highs of only 69 on the 24th and 25th, the first highs in the 60s since June 17. The low of 38 on the 24th was the first low in the 30s since May 2. 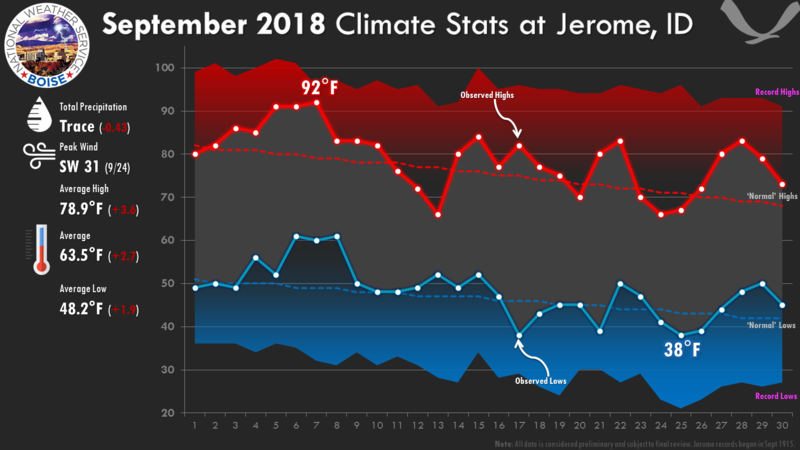 As the eastern portion of the ridge edged inland, warmer air raised temperatures above normal from the 27th through the 29th, with highs in the low 80s. During that time, an upper-level low was drifting slowly eastward toward California. By the morning of the 30th, it was centered over the Oregon-northern California coast. 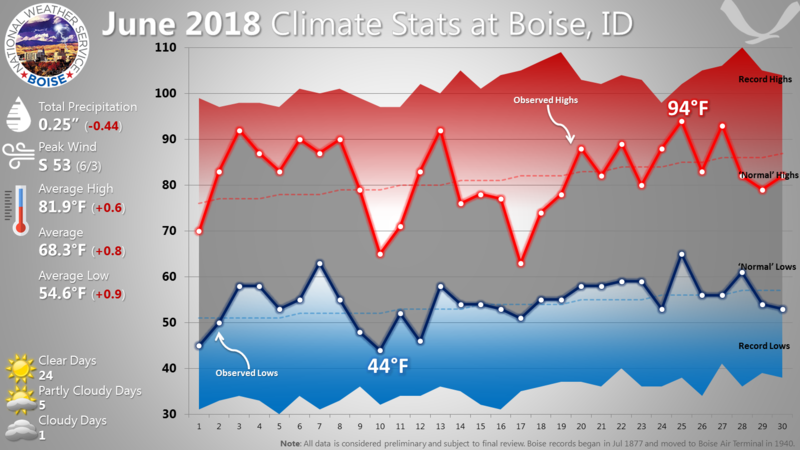 Its only effect on Boise was a few clouds and slightly cooler temperatures. June`s average temperature was one degree above normal, giving a ranking of 23rd warmest in the 79 years of Boise Airport records. Highs reached or exceeded 90 degrees on 6 days, which is exactly normal for June. There were no record highs or lows. It was a month of changeable temperatures, owing to a procession of upper level troughs and ridges from the north Pacific. Highs ranged from 63°F on the 17th to 94°F on the 25th. It was one of the drier Junes, with only a quarter inch of precipitation. Along with June 1957, it ranks 20th driest at the Boise Airport. Measurable rain fell on only four days: the 7th, 9th, 17th, and 18th. With the exception of the 17th, rainfall totals were under a tenth of an inch. On the 14th a trough from the Gulf of Alaska stalled over the northwest states. Cooler air aloft flowing into the trough from western Canada caused it to intensify, and it strengthened further as it entrained moisture from east of the Rockies. 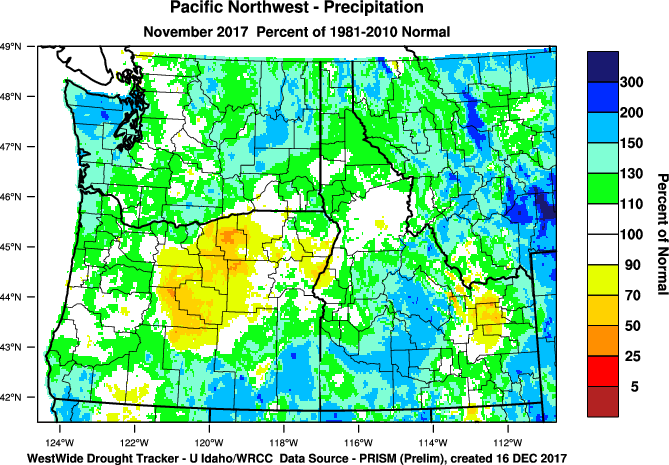 On the 17th, 0.13 inch of rain fell at the airport, but much heavier amounts were reported in northern and eastern Idaho and portions of the central Idaho mountains between the 16th and 18th. Strong winds were observed on three occasions early in the month. At 7:30 pm on the 3rd, outflow from a shower ahead of a strong cold front produced a gust of 53 mph from the south, resulting in blowing dust reducing visibilities. At 6:25 pm on the 7th, outflow from a thunderstorm gusted to 41 mph from the southeast, accompanied by brief moderate rain. And at 12:50 pm on the 9th, a gust of 43 mph from the northwest followed another strong cold front. April was characterized by changing weather patterns. 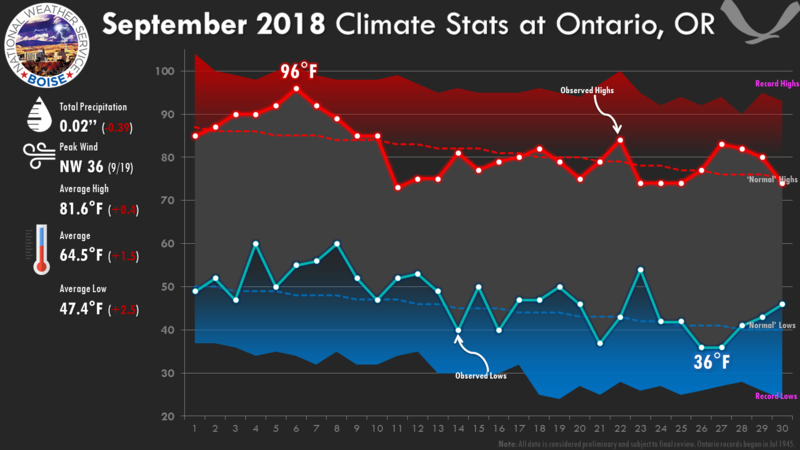 Migrating high pressure ridges and low pressure troughs at upper levels brought alternating periods of above and below normal temperatures, but overall there was a gradual warming trend, and the monthly average was slightly above normal. Most precipitation fell during the first 16 days of the month, when half the days had measurable rain. The final 14 days were dry, except for a couple of trace events. 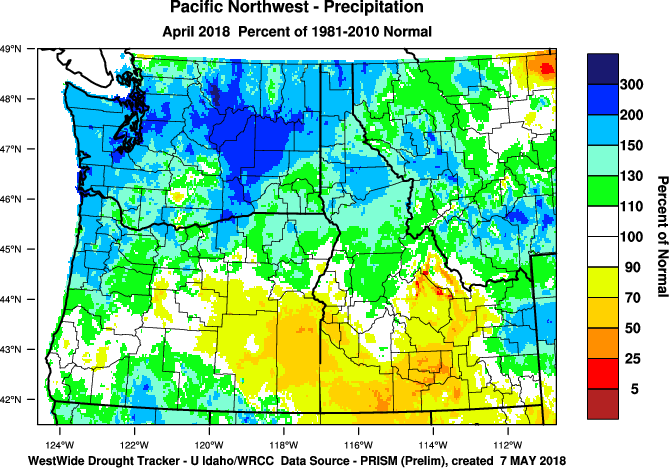 As a whole, April was slightly drier than normal. The first half of the month also saw three strong wind events. Boise fared somewhat better than the surrounding region, where there was local damage, as winds in the Treasure Valley weren`t quite as strong. On the 2nd a rapidly moving upper level trough from the Gulf of Alaska crossed our area. It was accompanied by a strong jet stream, and a thunderstorm which dropped small hail on some parts of the Treasure Valley. Some of the jet energy reached the surface as the cold front came through, producing a gust of 49 mph at the airport. 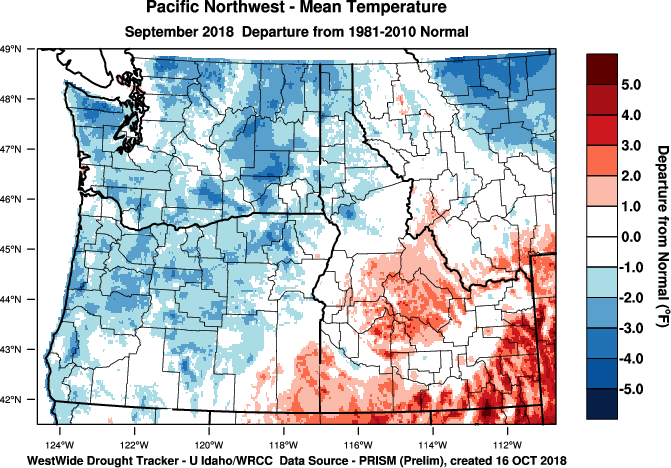 On the 7th another cold front crossed the Boise area, propelled rapidly inland by an initially strong upper level trough approaching the Washington coast. The front triggered thunderstorms, one of which generated a gust of 55 mph from the northwest at the airport. Over a quarter inch of rain was measured with this storm. The trough itself faded out as it progressed inland. On the 12th a deeper, colder trough moved over our area. Two tenths of an inch of snow fell at the airport, but it melted quickly. On the 16th an even deeper trough pushed inland, accompanied by a quarter inch of rain and a trace of snow. That system was followed by a more settled, warmer period, with temperatures near or above normal from the 19th through the 28th. On the morning of the 18th another weather system was poised just off the northwest coast, but instead of heading for Boise, it went south to California on the 19th then east over the Colorado plateau on the 20th. Our area was dominated by high pressure from the 20th through the 27th. 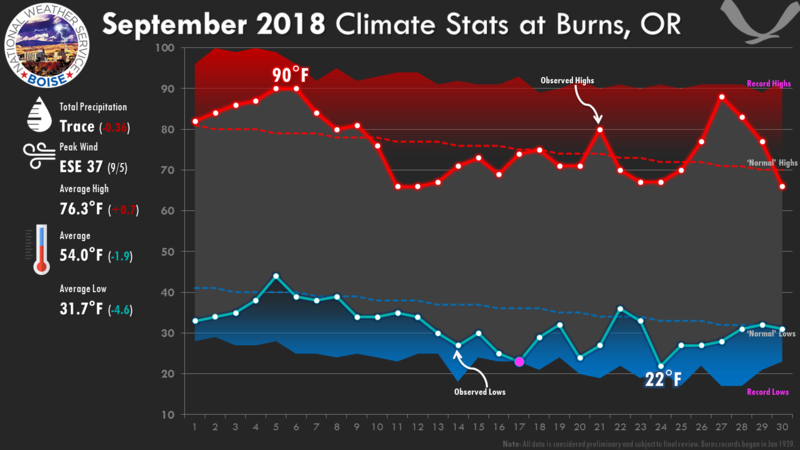 On the 27th the temperature maxed out at 90°F, two degrees shy of the record. The early taste of summer was ended by a cold front on the 28th, followed by a slow moving upper level trough on the 29th. The combination of cold air aloft and surface heating in the trough created instability which triggered convective showers but only traces of rain at the Boise Airport. The trough remained on the 30th and was expected to linger a few more days. 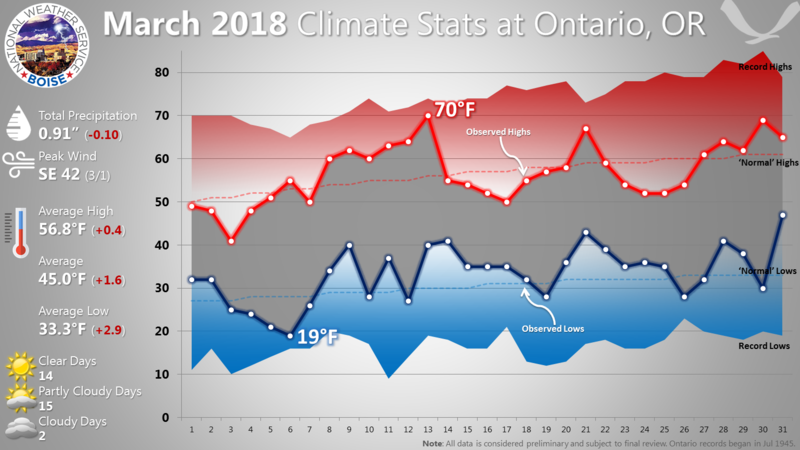 The changeable weather of March 2018 was typical of late winter and early spring. The progression of low pressure troughs and high pressure ridges brought alternating periods of warm and cold temperatures, yielding a close-to-normal average. There were no record highs or lows. Episodes of active weather and moderate precipitation occurred as each trough and its accompanying cold front entered our area. The 0.54 inch rainfall on the 14th tied the record for the date set in 1927. 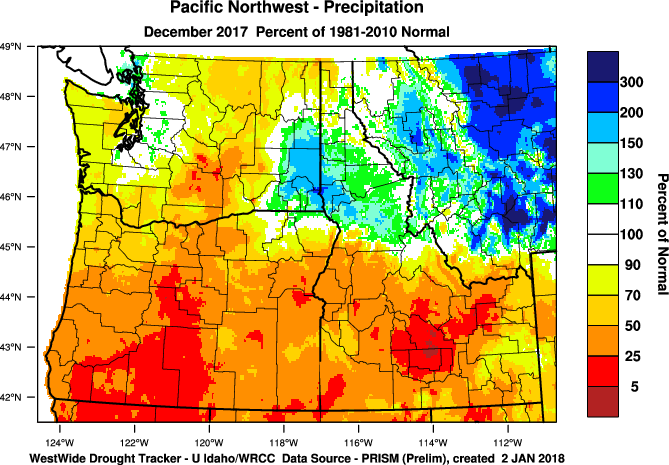 The 1.89 inches for the month was 0.50 inch above normal and ranks in the wettest 20 percent of Marchs at the airport, and the wettest 25 percent at all Boise locations. Snowfall for the month was 2.6 inches, mostly falling on the morning of the 25th. The monthly normal is 1.3 inches. The first four days of March were dominated by an upper level trough which brought cold temperatures but little precipitation. The 23°F on the 4th was the low for the month. Temperatures rose above normal on the 8th as an upper level ridge began to build over the region. The ridge reached its maximum amplitude on the 12th, allowing temperatures to rise into the low 60s. 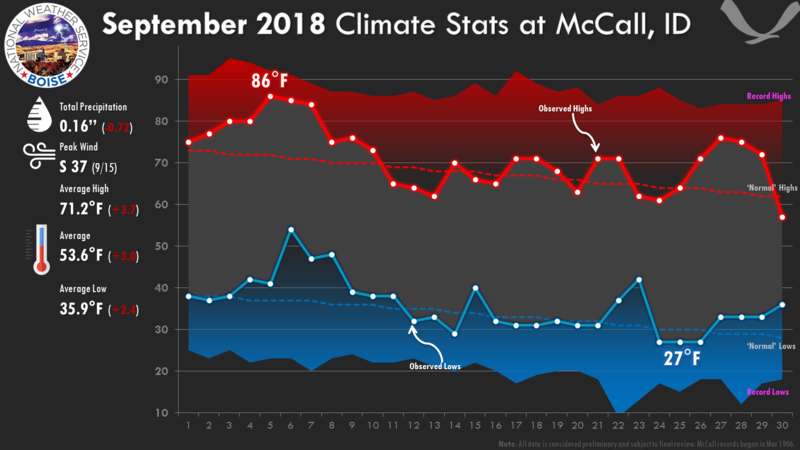 As the ridge began to exit, southerly flow ahead of the next upstream trough pushed the temperature to 69°F on the 13th, the high for the month. The trough sent a strong cold front inland, and convective showers ahead of the front were preceded by northwest winds gusting over 30 mph. When the showers reached the Boise airport just after 4 am, moderate rain began and persisted for about an hour before tapering off and ending. The trough drifted slowly inland on the 16th and 17th, preventing temperatures from rising above the upper 40s on those days. The last weather maker of the month was another strong upper level trough which stalled off the coast of British Columbia on the 22nd. This trough extended far enough south to tap subtropical moisture. Like its predecessor, moderate rain preceded the cold front on the afternoon of the 22nd. The front passed the airport at about 7:30 pm, accompanied by the first thunderstorm of the spring season. The strongest convection and heaviest rain stayed west and north of Boise. 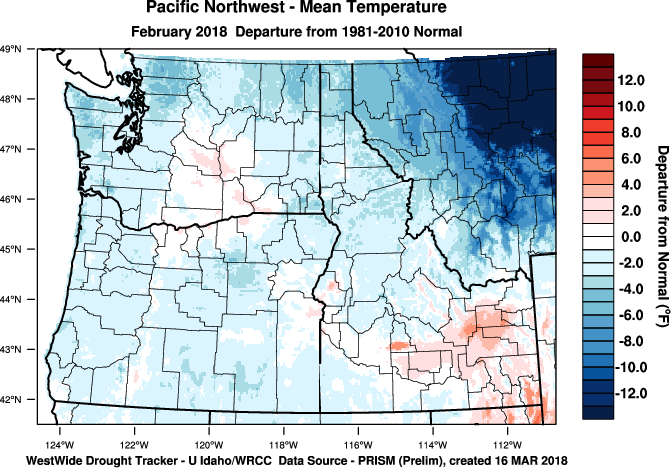 As the trough moved inland and weakened on the 25th, it produced the last measurable precipitation of the month, falling as 2.1 inches of snow. 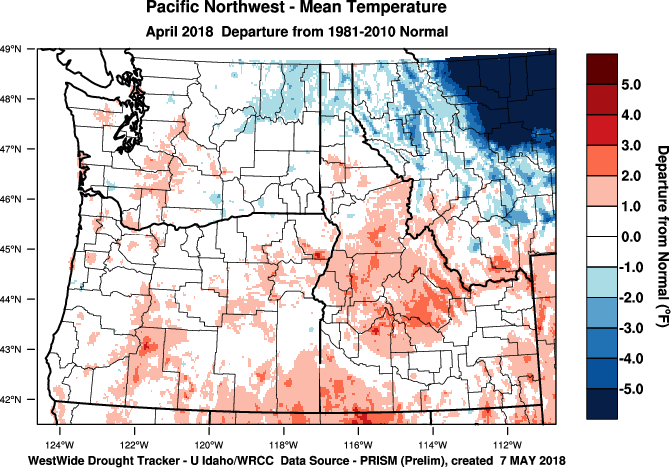 The cold north pacific air was responsible for a high of only 45°F that day, the chilliest maximum since the start of spring. Following this system, west-northwest flow aloft returned temperatures to near normal from the 28th through the 31st. February 2018 can be described as three seasons in one month. It began with early spring. 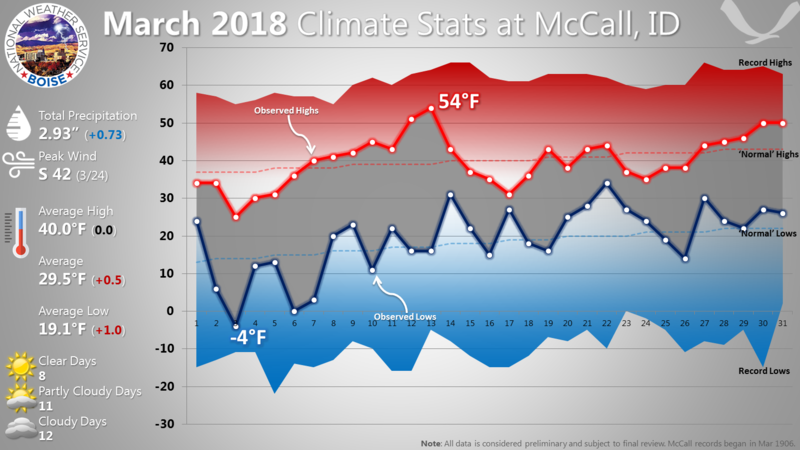 The 1st through the 9th had the same average temperature as the last half of a normal march. The 59°F on the 2nd tied the record for the date set in 1881. The 61°F on the 3rd eclipsed the old record of 60°F in 1953. 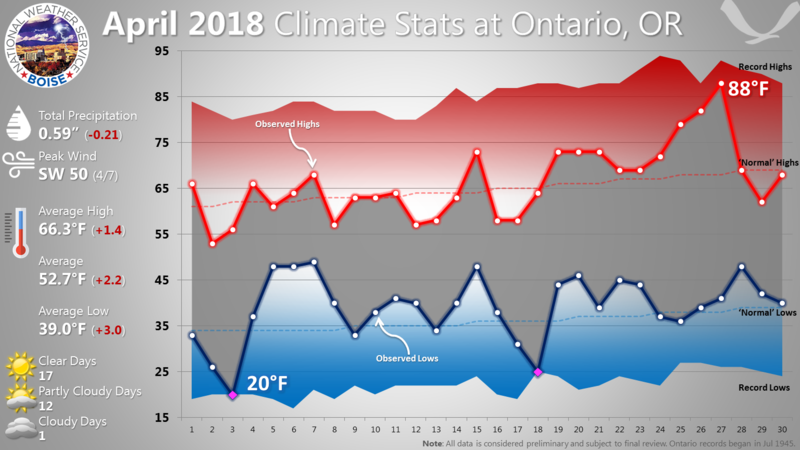 Temperatures from the 10th through the 18th were near normal for late winter. It was back to mid-winter from the 19th through the 28th, which averaged colder than a normal December. 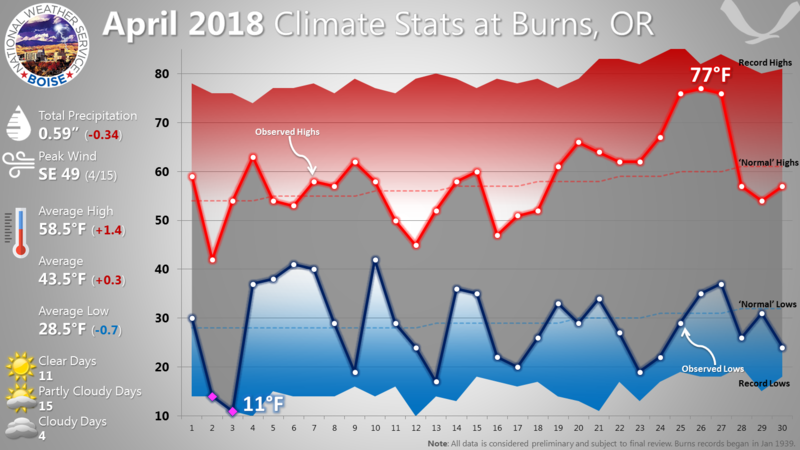 The average temperature for the entire month was deceptively close to normal. 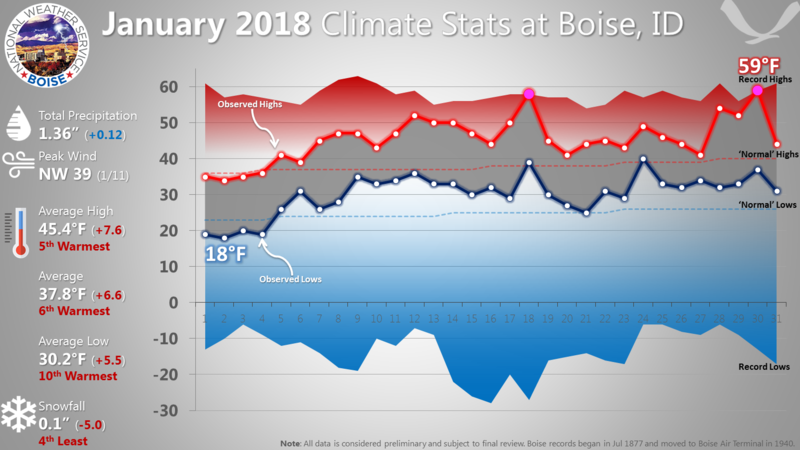 February is usually the driest winter month at Boise. 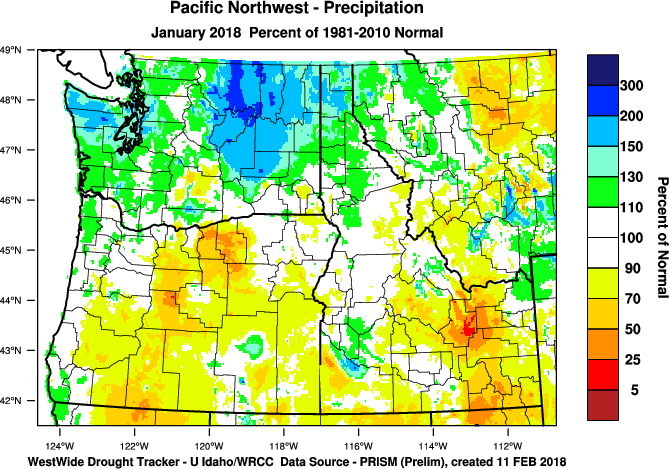 This February had only 56 percent of normal precipitation, despite heavier than average snowfall. Measurable precipitation fell on only 4 days. Snowfall totaled 7.4 inches, over twice the normal 2.8 inches. There was at least patchy snow cover each day during the last week of the month. The 4.9 inch snowfall on the 22nd set a record for the date. The old record was 4 inches in 1912. The greatest snow depth at the Boise Airport was 5 inches on the 22nd. A warm upper level high pressure ridge off the coast was responsible for the spring-like weather from the 1st through the 9th. It also kept most of the precipitation associated with Pacific weather systems east of our area. 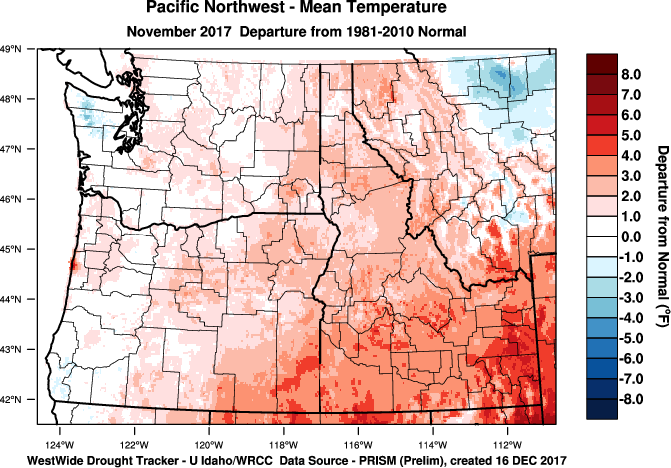 The ridge gradually shifted west, allowing northwest flow aloft to transport cooler but not unseasonably cold air into the Intermountain region from the 10th through the 18th. One weather system embedded in the flow was strong enough to bring Boise a quarter inch of precipitation on the 14th, including half an inch of snow. The ridge continued to drift west as a very cold upper level trough deepened over western Canada. Strong northerly flow on the west side of an upper level low over Hudson Bay pushed the trough south of the border. 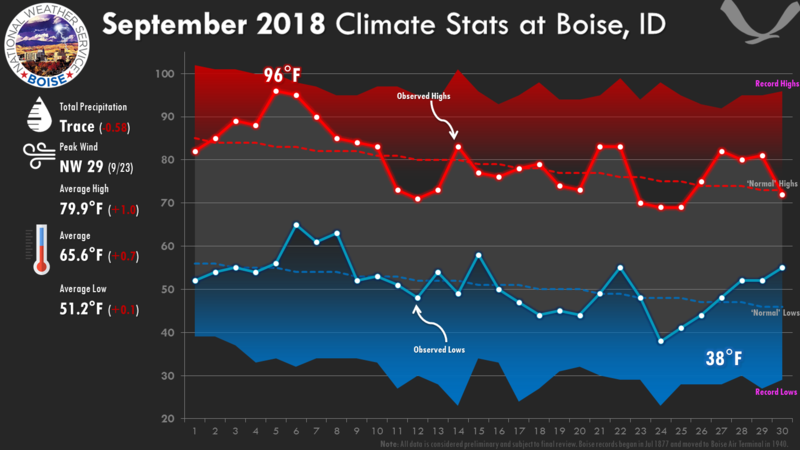 The cold front ahead of the trough passed Boise at about 9 pm on the 17th. Following the front, the wind increased from the northwest, and a peak gust of 43 mph was recorded at the airport just after midnight. 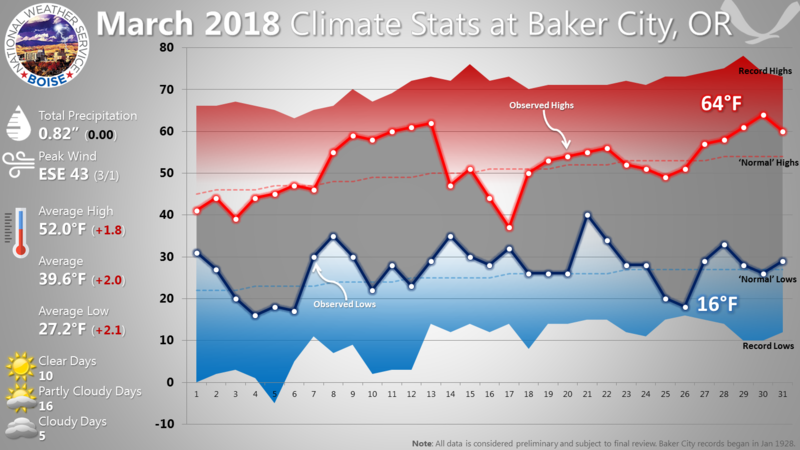 Temperatures initially were not unseasonably cold, but by the 19th modified arctic air had begun to filter into the Treasure Valley, while the true arctic front was stalled in the central Idaho mountains. 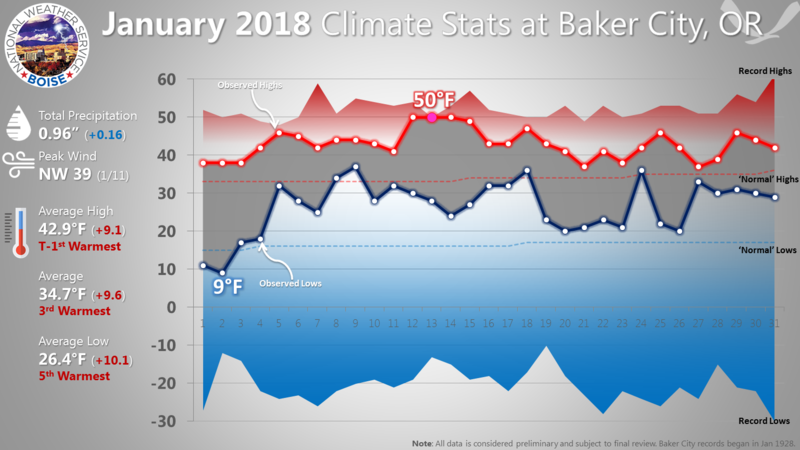 Although the coldest air stayed well to our north and east, clear skies, light winds, and very dry air allowed the temperature to drop into the single digits in the Boise area by sunrise on the 20th. The low of 9°F at the airport was the coldest since the 8 degrees on December 24, 2017. The cold pattern persisted through the end of the month, with a deep upper level trough anchored over the western U.S. and western Canada. Temperatures remained unseasonably cold, and weather disturbances moving into the trough from Alaska brought periods of snow. 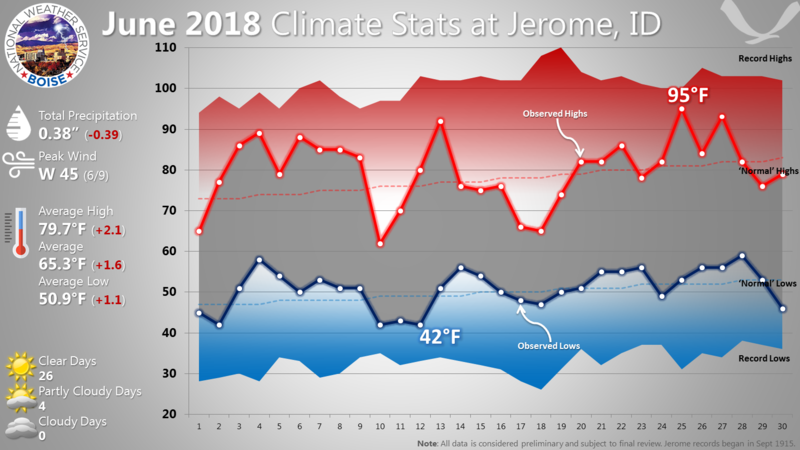 January 2018 was the fourth warmest on record at the Boise Airport. 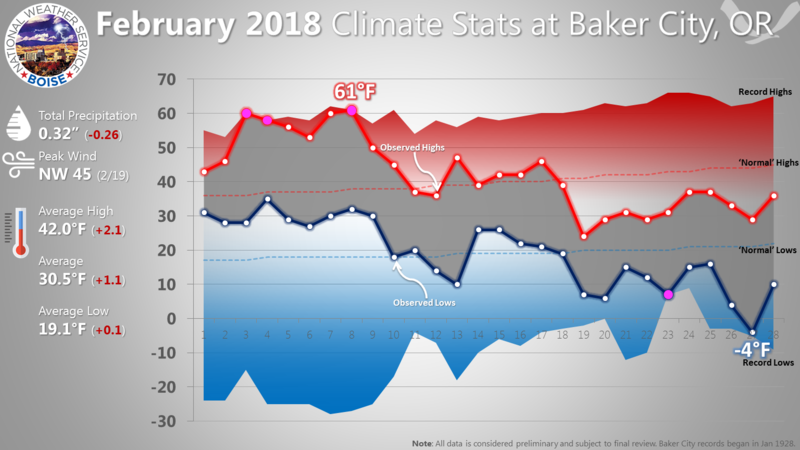 For all Boise locations it tied January 1914 for sixth place. 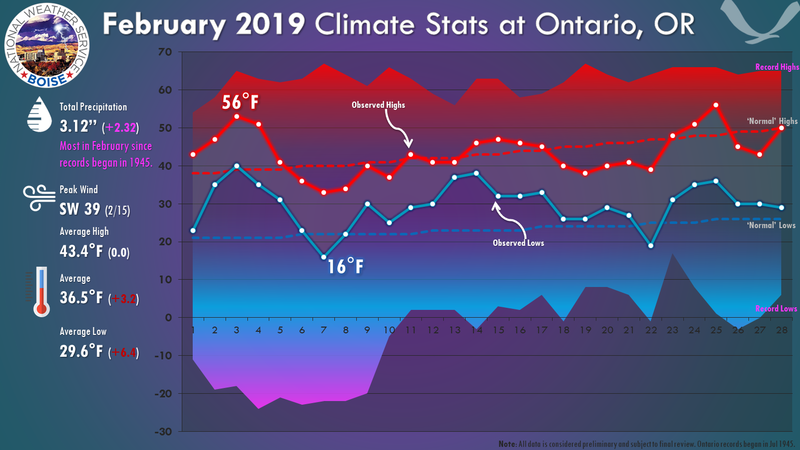 The monthly average of 37.8 degrees was 6.5 degrees above normal, and it even exceeded February’s normal of 36.5 degrees. Only the first four days of the month were below normal. 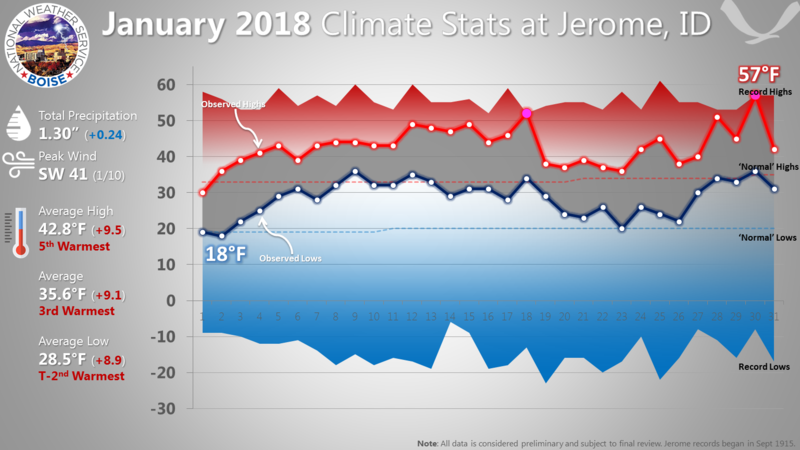 It is noteworthy that, prior to this year, the top five warmest Januarys at the airport occurred during El Niño winters, and three of those were strong El Niños. 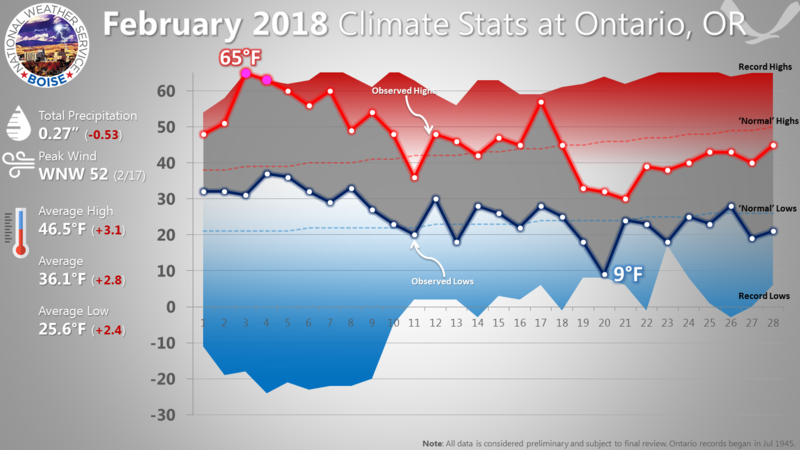 January 2018 didn’t fit the pattern, as a weak La Niña was in effect. There were two record highs, each occurring ahead of strong cold fronts. 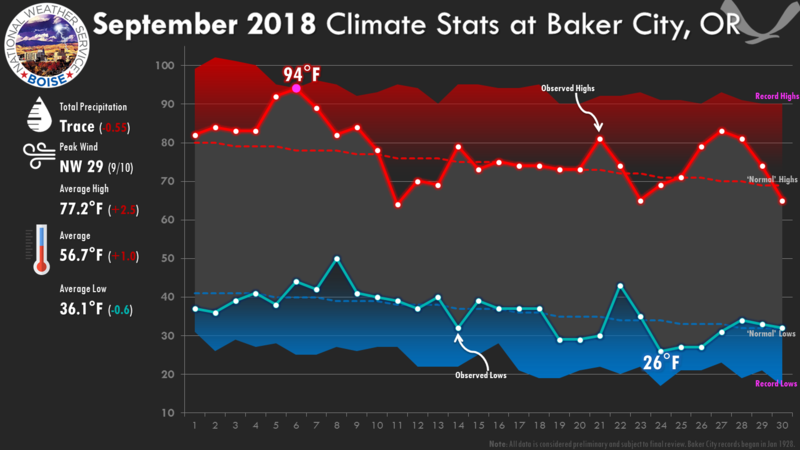 The 58°F on the 18th and the 59°F on the 30th broke the previous daily records of 57°F in 1998 and 56°F in 1992. The unusually mild temperatures resulted from a combination of a progressive pattern and a persistent warm upper level high pressure ridge over the Western U.S.
Westerly flow aloft brought mild moist Pacific weather systems inland across the northern intermountain region, temporarily displacing the ridge, which always managed to rebuild. The active pattern hindered the formation of temperatures inversions and blocked invasions of cold air from western Canada. Precipitation totaled 1.36 inches, close to the January normal of 1.39 inches. Most of it fell during two episodes. On the 9th a cold front produced nearly half an inch of rain at the Boise Airport. During the afternoon of the 19th another cold front generated nearly a quarter inch of rain. The upper level low pressure trough which followed the front brought an additional two tenths of an inch of rain. On the 30th the last cold front of the month passed the airport at 1:40 pm MST, with a wind gust of 34 mph from the northwest, but no precipitation. The only measurable snowfall was 0.1 inch on the 25th. The total for January 2017 was 21.5 inches. Normal is 5.1 inches. 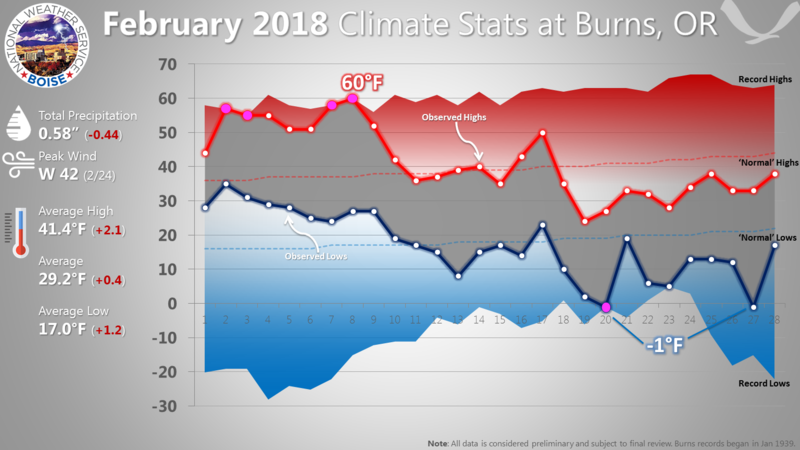 There have been Januarys with less snow. Only traces fell in 1934, 1961, and 2003. 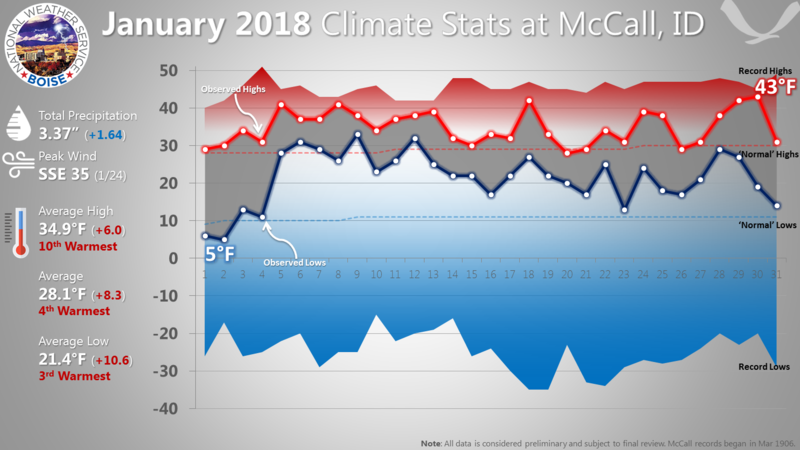 McCall, Idaho recorded its 4th warmest January on record in 2018. 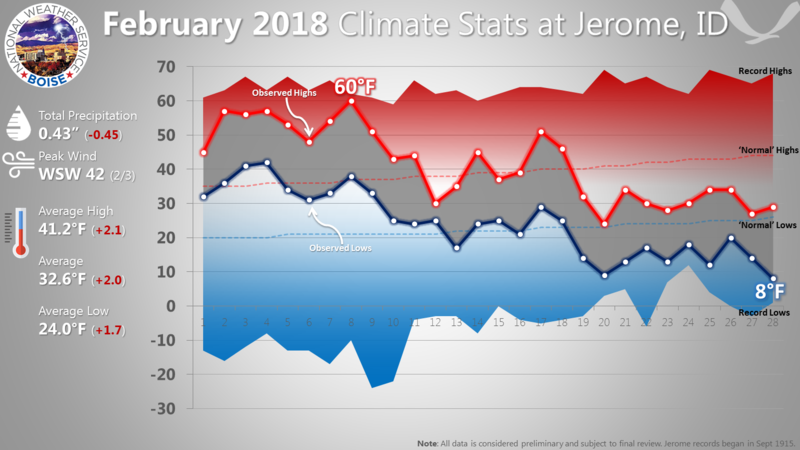 Daily average minimum temperatures in January 2018 averaged 21.4°F, 3rd warmest on record. 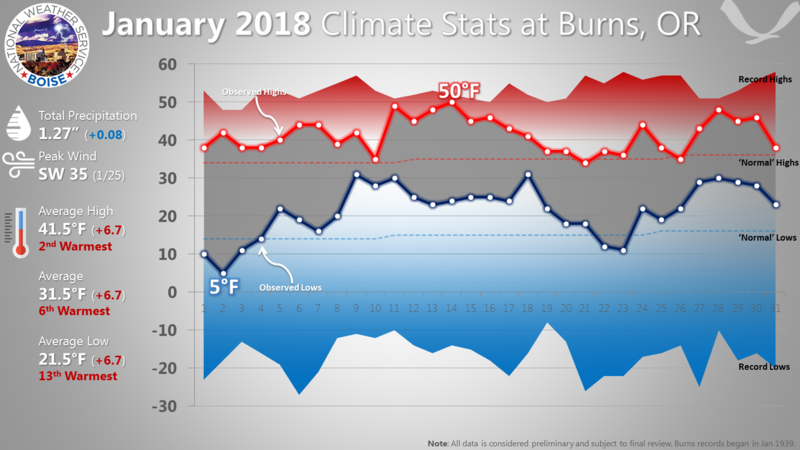 Burns, Oregon recorded their 6th warmest January on record in 2018. 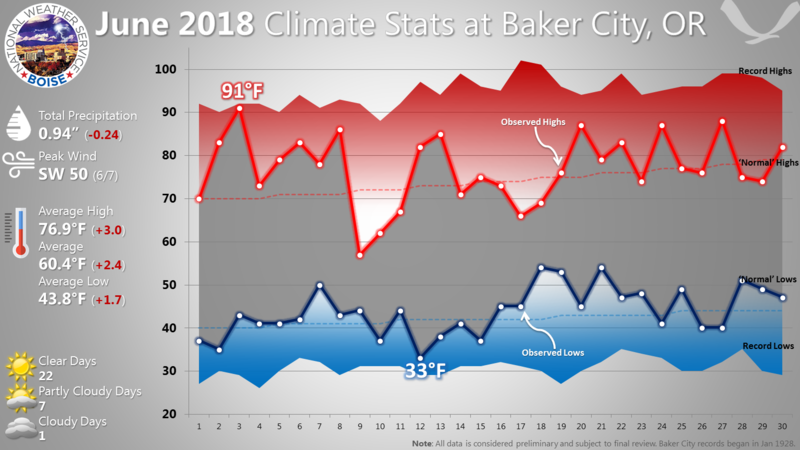 Baker City, Oregon had their 3rd warmest January on record in 2018. 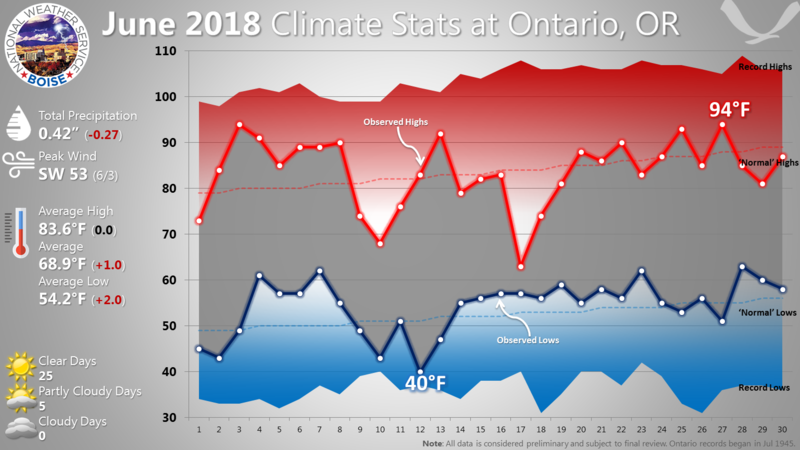 Average maximum temperatures reached 42.9°F, tied for the warmest on record in January since records began in 1928. 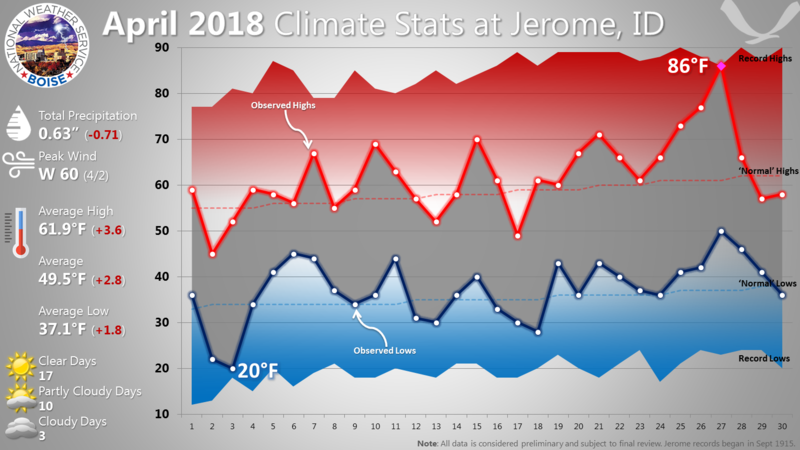 Jerome, Idaho had their 3rd warmest January on record since 1916. 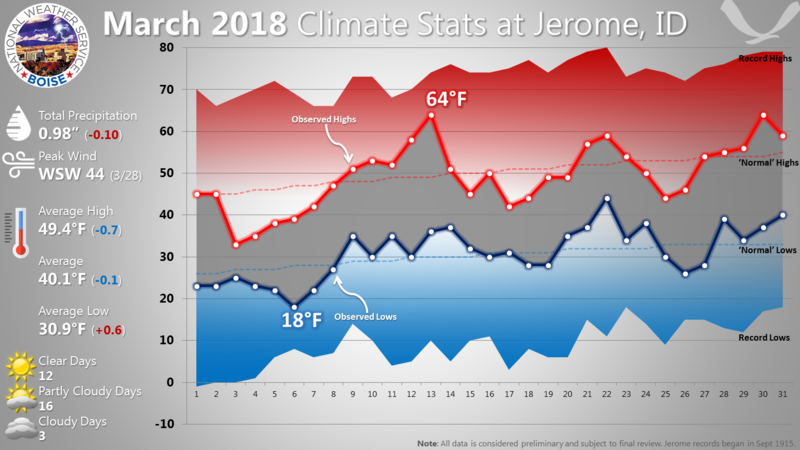 Two record highs were set in the month of January. 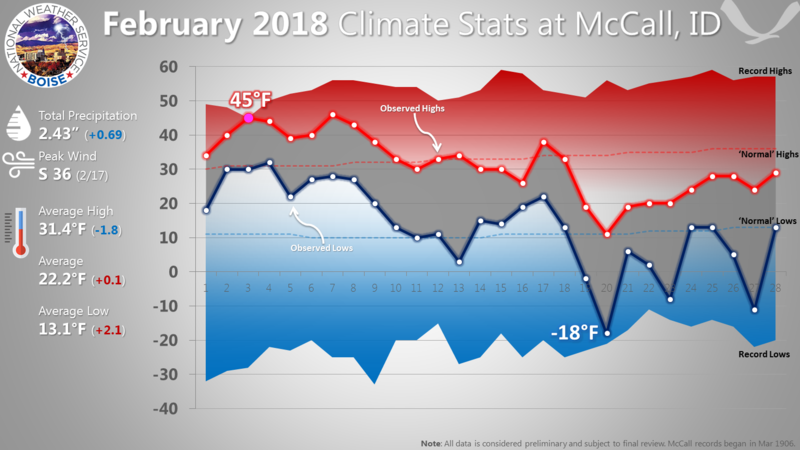 Average minimum temperatures tied for the second warmest on record in January at 28.5°F. 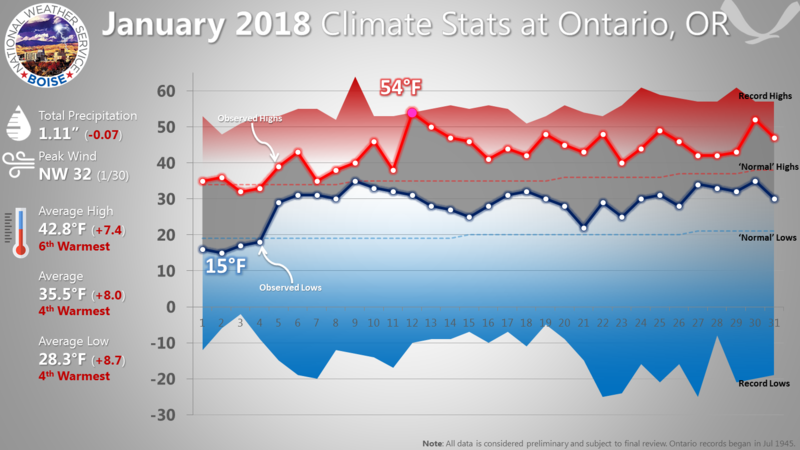 Ontario, Oregon had their 4th warmest January on record. 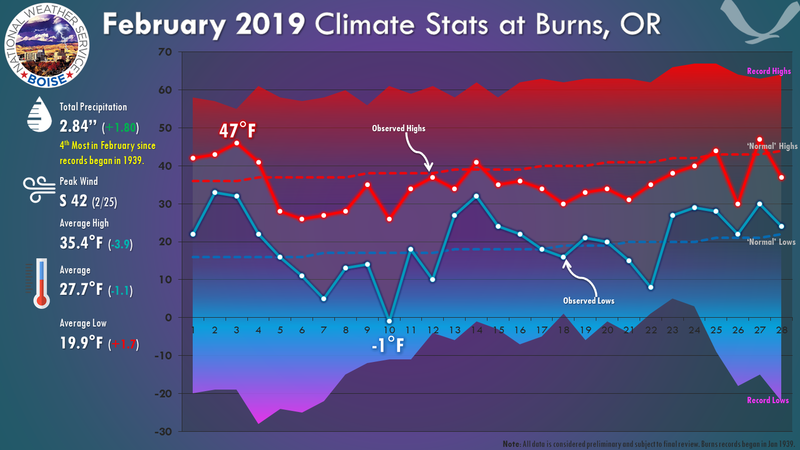 A daily record high temperature of 54°F was recorded on January 12. 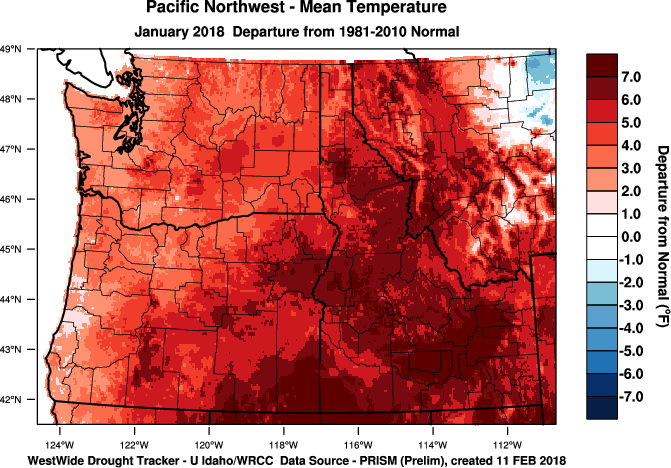 With the upper level high pressure ridge over the Great Basin,the storm track was directed to the north across British Columbia, Washington, northern Idaho, and western Montana, leading to warmer than normal temperatures. 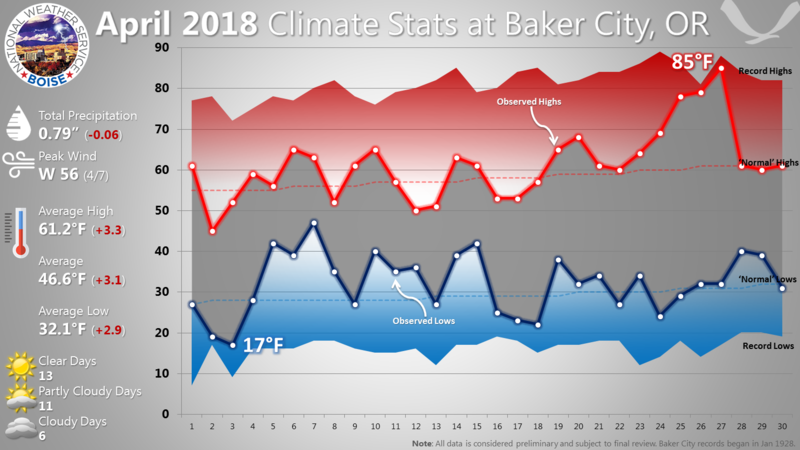 Temperature inversions plagued the Treasure Valley most of the month, resulting in below normal temperatures at Boise on all but eight days. 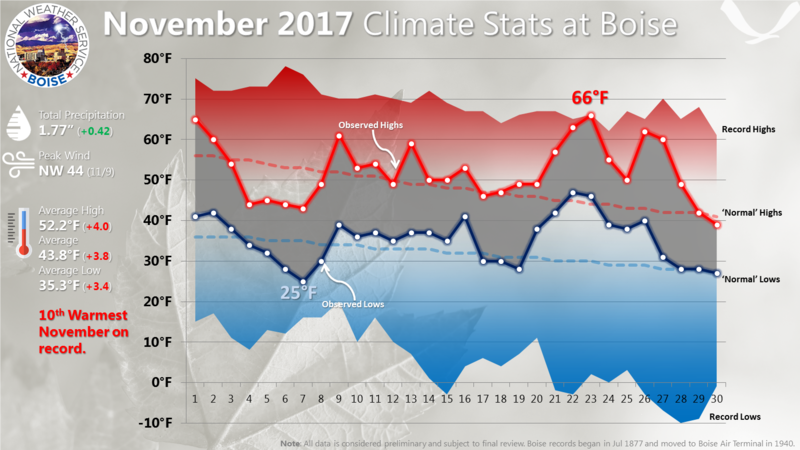 Although it ranked among the coldest 25 percent of Decembers since airport records began in 1940, it averaged 5 degrees warmer than December 2016. 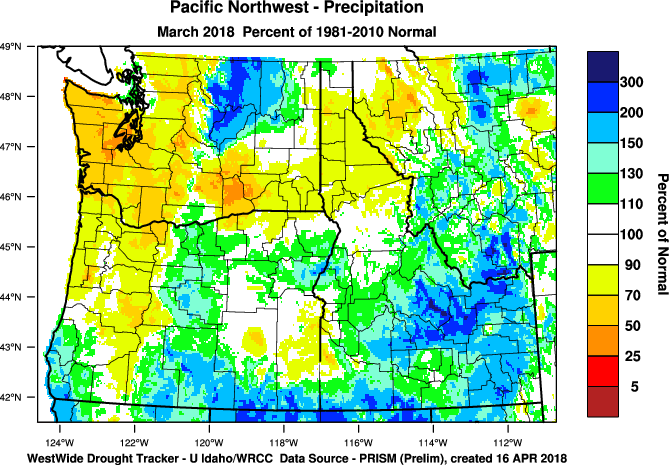 A persistent high pressure ridge kept the Boise area dry through much of the month. Precipitation was nearly half an inch below normal, and half the December 2016 total. The month started out fairly mild under west-southwest flow aloft ahead of an upper level low pressure trough. 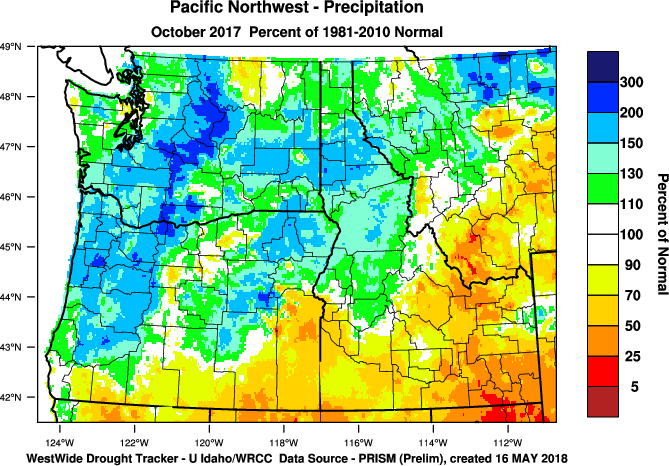 The trough crossed the Boise area on the 3rd, bringing the largest one-day precipitation of the month, mainly in the form of rain. As this system exited to the east, an upper level high pressure ridge built offshore and expanded inland. 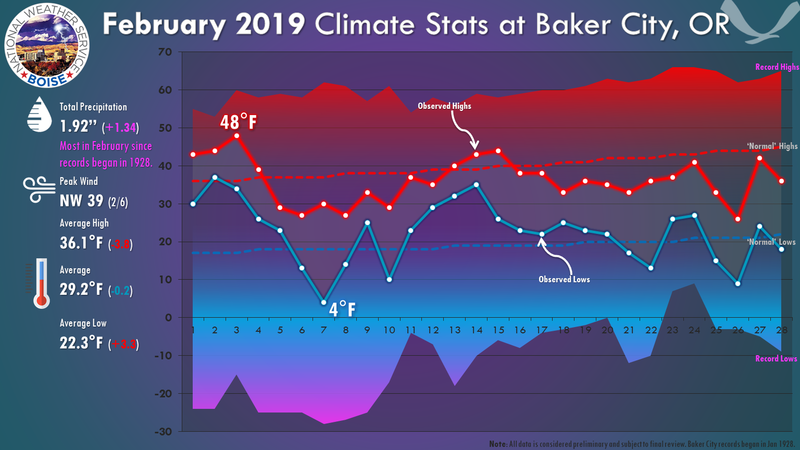 By the 5th an inversion had become established in the Treasure Valley, and temperatures remained below freezing from the 7th through the 15th. On the 16th an upper level trough destabilized the atmosphere enough to break the inversion, and temperatures continued to warm as the upper level flow shifted into the west and southwest in advance of tet another upper level trough. The 19th and 20th were the warmest days of the month, with highs of 52 and 51. By the 21st the trough had moved east of our area. It was followed by moist northwest flow aloft and a cold front which brought snow totaling 6 inches on the 22nd and 23rd. The accumulation of 5 inches was the first measurable snow cover since February 4. A combination of modified arctic air, overnight clearing, fresh snow cover, and calm winds caused the airport temperature to fall to 8 degrees by sunrise on the 24th, the coldest reading since the 7 degrees on January 18. More snow was on the way. It started at about 4 pm Christmas eve as a warm front approached from the west. By Christmas morning 3 inches of new snow had fallen. Warming continued at higher elevations, ensuring that cold air would remain trapped in the valley for a few more days. On the 30th a cold front passed through the area. It was felt as a warm front in the valley, as colder air aloft behind the front broke the inversion, allowing the airport temperature to climb to 43 degrees that afternoon. On the 31st strong high pressure provided mostly clear skies. 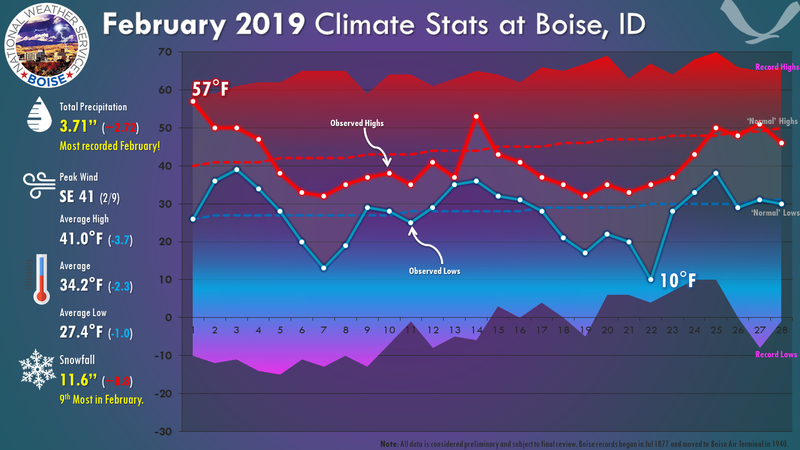 Although a shallow inversion had formed overnight, the sun warmed the surface enough during the day to mix the air, and temperatures around Boise warmed into the 35-40 degree range. 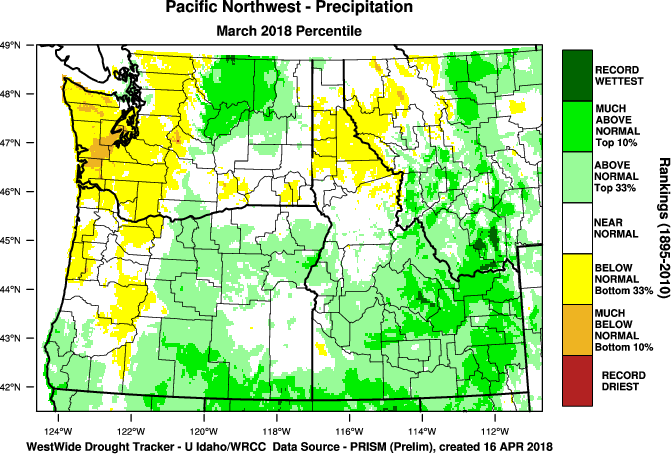 Precipitation across much of southern Idaho and Oregon was well below normal as a persistent upper level high pressure led to an inversion with cool conditions in the valleys and warm conditions in the mountains. 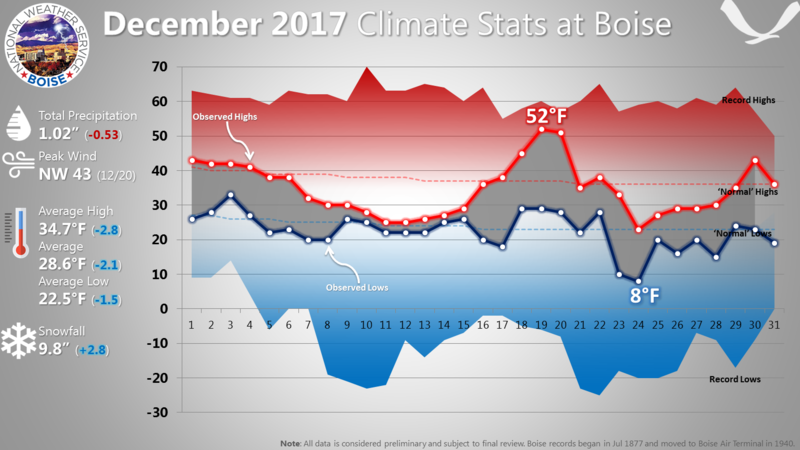 November`s average of 43.8 degrees is the tenth warmest at the Boise Airport. Aside from a cool spell from the 4th through the 8th, temperatures averaged above normal on most days. Only ten nights had lows were below freezing. The low of 47 on the 22nd set a record high minimum for that date, eclipsing the old record of 46 set in 1921. Measurable rain fell on half the days. The monthly total of 1.77 inches is nearly half an inch above normal and ranks among the wettest 25 percent of Novembers at the airport. Typical of fall, the weather pattern was active, with passing weather systems bringing showery periods and changeable temperatures. 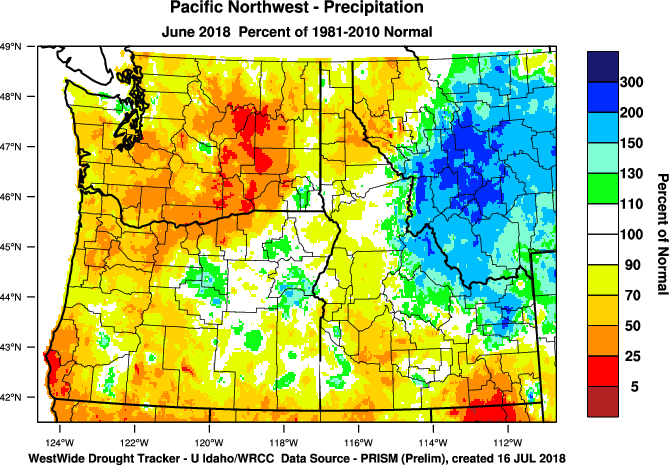 On the 3rd, a low pressure trough from British Columbia brought Boise the coolest weather since last winter, and over half an inch of rain from the 3rd through the 6th. Below normal temperatures persisted through the 8th. The low of 25 on the 7th was the low for the month and the coldest reading since February 25. Warmer more seasonable weather returned on the 9th. 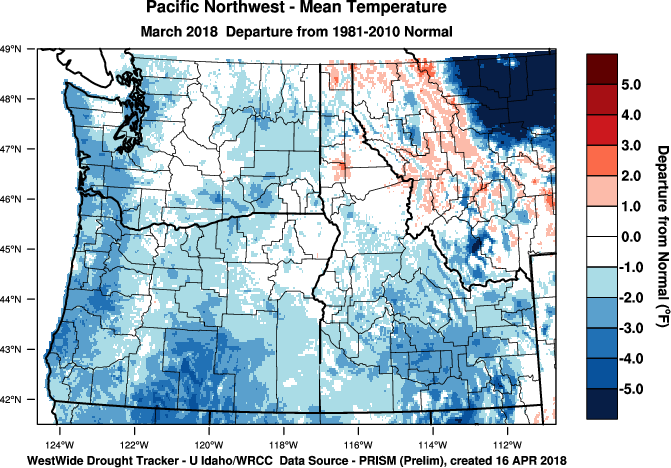 A weak high pressure ridge over the western U.S. and a persistent low pressure trough off the northwest coast kept us under southwest flow aloft, maintaining near normal or slightly above normal temperatures through the 20th. Weather disturbances moving inland weakened as they traversed the ridge, but they retained enough moisture for moderate amounts of rain on the 10th, and again on the 14th and 15th. 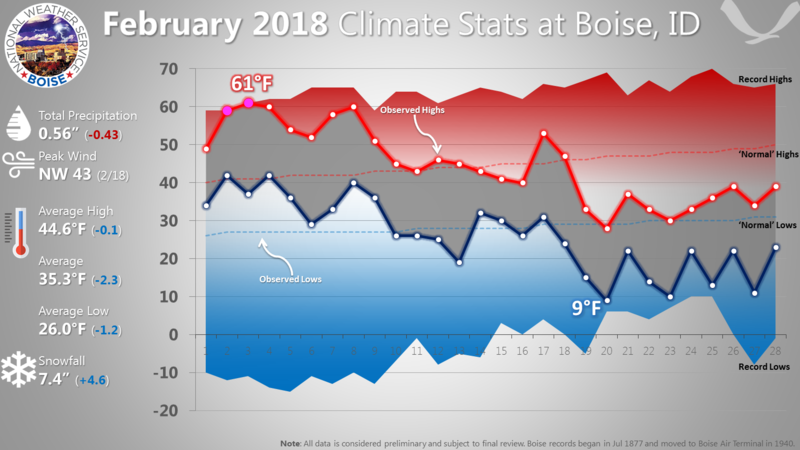 27th, Boise’s daily average temperatures ranged from 6 to 19 degrees above normal. Moisture and weak weather systems moving through the north portion of the ridge generated nearly daily showers as far south as northern Nevada. Amounts were mostly light, but a stronger disturbance on the 24th produced a quarter inch of rain at the Boise airport. 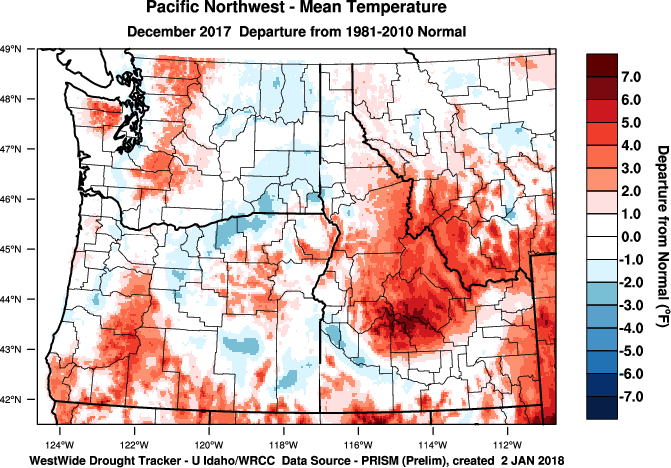 The ridge weakened following a Pacific weather system which crossed the great basin the 27th, and temperatures at Boise returned to near normal on the 29th following a Pacific cold front. October 2017 ranks among the coldest 22 percent of Octobers at the Boise airport. Temperatures averaged 7.1 degrees below normal from the 1st through the 16th, and 1.3 degrees above normal for the rest of the month. Precipitation totaled near normal. The first freezing temperature of the season was the 31°F on the 9th, a day ahead of the average date. There were no record highs, lows, or daily precipitation amounts. During the first half of the month, cold upper level troughs were the dominant features. 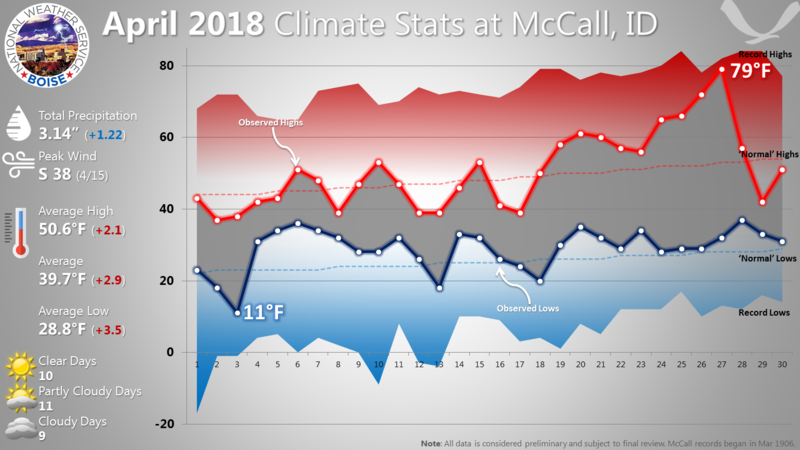 Brief periods of west or southwest flow aloft raised temperatures to near normal on the 6th, 7th, and 10th, but there were no above normal daily averages. 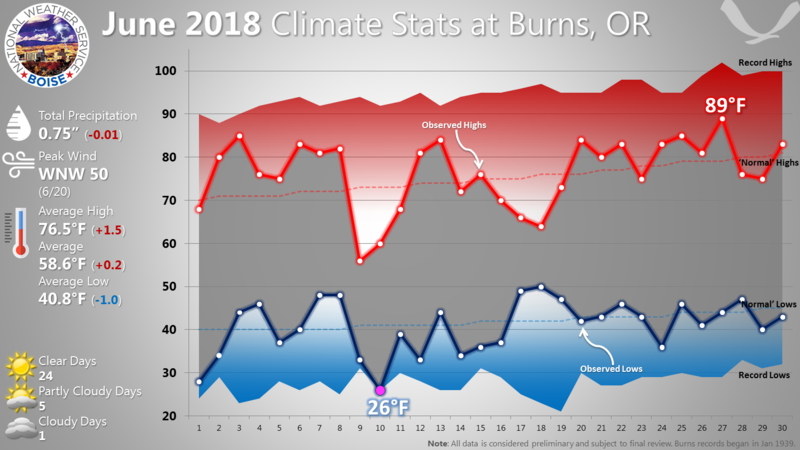 During the last half of the month, temperatures were near or above normal most days, thanks to west or southwest flow aloft, and strong upper level high pressure ridges on the 23rd and 24th, and again on the 27th and 28th. This warmer pattern was briefly interrupted by a north Pacific cold front which crossed the Boise area around 4:30 am on the 20th. The frontal passage was accompanied by northwest winds gusting up to 42mph at the airport, causing visibility restrictions in blowing dust. Rain settled the dust a couple of hours later as a cold upper level trough pushed inland behind the front. Precipitation on the 20th and 21st totaled 0.37 inch at the airport. One location closer to the foothills reported around half an inch of rain. 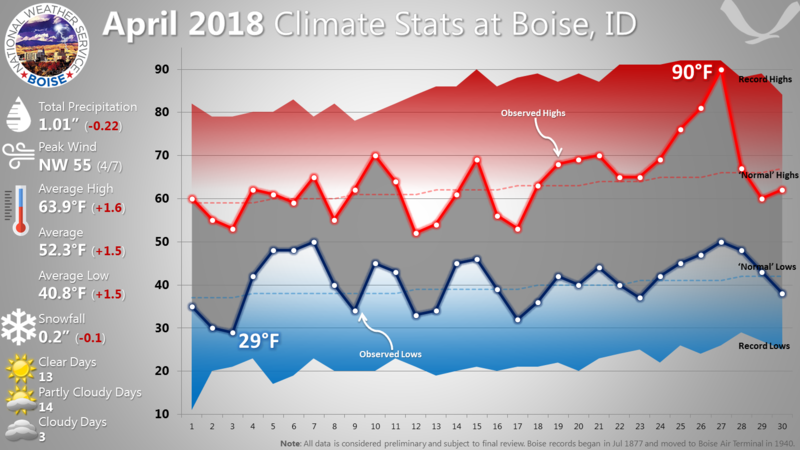 On the 29th, the upper level ridge, which had kept Boise warmer than normal on the 27th and 28th, shifted west. 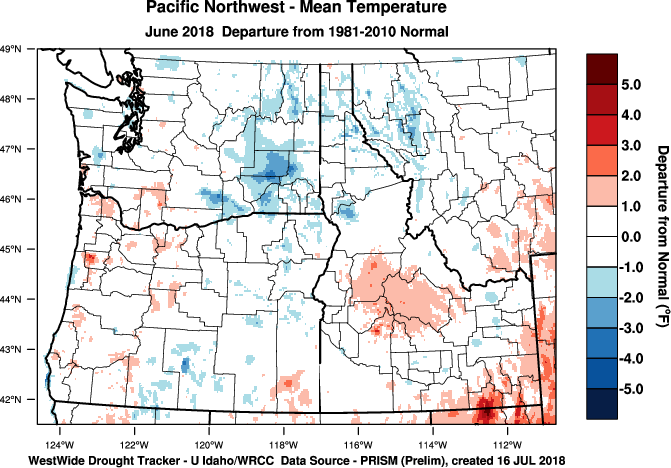 This put our area under northwest flow aloft, allowing cooler air from British Columbia to spread south across the northern intermountain region.